A fire can spread out of control and become too big to manage in just a few minutes. In the time it takes for you to react to a fire alarm, a sprinkler system can contain, control or extinguish the fire, protecting your building and saving lives. 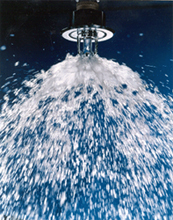 As well as saving lives, sprinkler systems can prevent costly damage. Every week, for example, 20 schools are destroyed or damaged by fire. They can also enable you to make more cost-effective use of your premises as building and fire safety regulations often allow parts of a building to be used which would be deemed unsafe without a sprinkler system. Also, fire walls do not always have to be built to as high a rating if a sprinkler system is in place. Some insurance companies also offer reduced premiums for houses and buildings that incorporate sprinkler systems. Brookside Fire Service engineers are completely up to date with the very latest building codes, insurance company recommendations and fire regulations. They will carry out a full free survey of your premises and advise you on where you need sprinklers and what products will be best for your needs. Whether you need a complex commercial system, a residential system or a small domestic sprinkler system, we will meet your exact requirements. We can integrate your sprinkler system with your smoke detectors, heat detectors, fire alarms, the rest of your security system. With extensive experience in the fire prevention and fire fighting industries, Brookside Fire Service has established itself as one of the industry leaders in the region. We supply, install, commission and service the complete range of fire protection equipment, including Extinguishers, Fire Alarms and Emergency Lighting.